DOCTOR WHO: Companion Pieces - KAMELION | Warped Factor - Words in the Key of Geek. Tony Fyler looks back at the unloved shape-shifter (as opposed to Frobisher, the much-loved one), and calls for an audio renaissance. If any companion in the fifty years of Doctor Who has a face for radio, and thus for brilliance in the Big Finish environment, surely that companion is Kamelion. Bought after a clever (not to say cunning) display of its capabilities, the Kamelion prop was quickly discovered to be almost bloody-mindedly useless, following in K9's proud tradition of mechanical awkwardness and exceeding even the tin dog's physical shortcomings, being frequently unable to simply stand up if unsupported by some unfortunate robot-minding member of the cast. Contrast the reality of the prop with the potential of the idea though and Kamelion flies free. His first use, in the underrated and perhaps slightly barking - but also deliciously atmospheric - The King's Demons shows his potential: you can program a robot till you're blue in the face but its performance, its charade at being an organic creature will still have flaws, tiny tells that give its game away. But Kamelion has a mind of his own, highly suggestible but capable of improvisation, caprice and even, to a degree, free will. His unique shape-changing abilities have seen him cunningly re-engineered as an instrument of war. And make no mistake about that: in the wrong hands (including the Master's hands), Kamelion has a deadly potential. Imagine Kamelion as Jesus. Kamelion as a gun-toting Gandhi, espousing violence rather than peace. Imagine Kamelion as Augustus Caesar, with the power to shape the world after his master's design and the true potential of this companion begins to reveal itself. 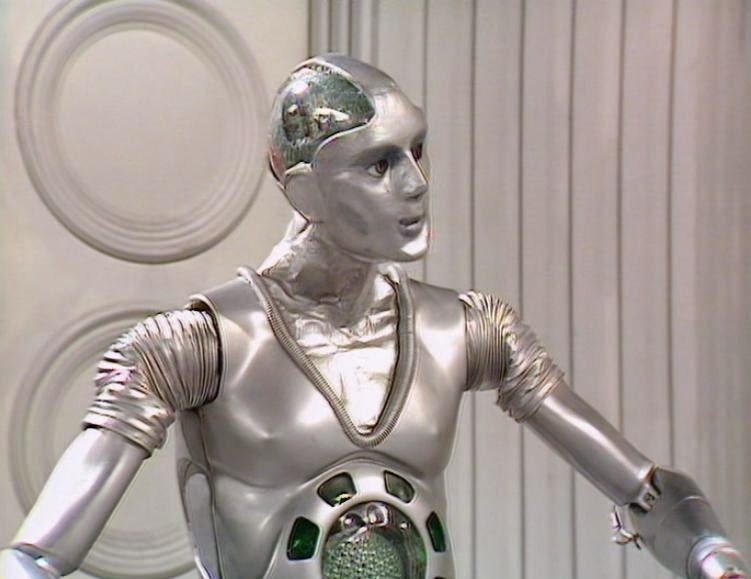 As in The King's Demons, Kamelion's true power to influence stories, situations and planets is best seen when he's not the robot, but the person the robot is pretending to be. In The King's Demons, Kamelion is being King John, miles away from where he should be (and is), for the rather jolly purpose (by the Master's standards) of robbing the world of Magna Carta. Clearly as far as the Master and Kamelion are concerned, it's a dress rehearsal for bigger, more cripplingly chaotic things - a delicious conceit in itself, showing the Master's contempt both for Earth history and his own timeline (where would the Third Doctor have been banished to? Where would the Delgado Master have materialised?). When Kamelion and the Doctor escape the Master's Meshugganing, the shape-shifter joins the Tardis crew...and then, in terms of on-screen adventures, he's unceremoniously shoved into the broom cupboard until the Master needs him - not in The Five Doctors but allllll the way over in the penultimate story of the Davison era. It's almost as though the Production Team forgot about him, or swept him under the balance sheet and were suddenly called to account for the expense of the robot prop, so figured they'd get one more story out of him and then put everyone out of their shape-shifting misery. Planet of Fire has at least a number of things to recommend it - an explanation of Turlough, the introduction of Peri, Peter Wyngarde as Timanov, and the subtext on the conflict between science and religion. Kamelion, bless his shiny little head, is not really among the good things in the story - he's there to get the Tardis crew into trouble and basically fetch and carry for the Mini-Master till he can get his mojo back. Kamelion's plea for destruction at the end of the story is an opportunity squandered in the glee that seems present in the sub-text - "Finally getting rid of the thing". Really it should have been a heart-wrenching scene, a creature with intelligence begging for destruction rather than allow its own fallibility to endanger its friends and the universe. It's a heroic self-sacrifice that should be at least as affecting as the death of Adric, but it never hits the viewer because we've never seen Kamelion achieve anywhere near his potential. Imagine what a shape-shifting sentient weapon could do in the right hands, and without the albatross of 80s animatronic realities to hamper it. 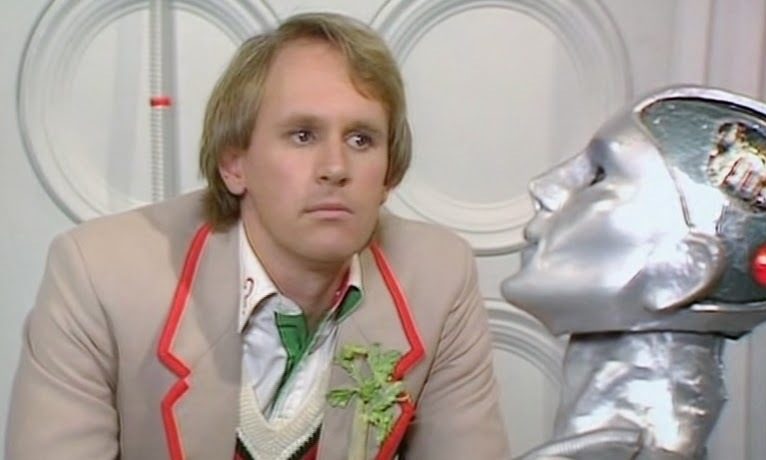 If you're having trouble picturing Kamelion as a heroic companion, just reflect that if he hadn't been action figured in the previous story, he could have nipped into the catacombs for the bats' milk that could have saved the Fifth Doctor, just as quick as you like. But beyond that, he could have impersonated Icthar and provided "another way" to stop the Warriors of the Deep. Could have out-Gravised the Gravis, and been a duplicate Davros to confuse the bejeesus out of the Daleks. Let your imagination go and Kamelion joins the ranks of the great could-have-been companions. So where are the Kamelion Chronicles in the Big Finish range? The tales of electronic derring-do: Kamelion in a dinner jacket, infiltrating alien business empires. 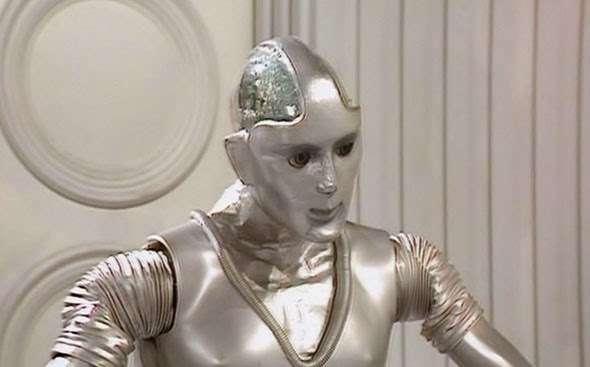 Kamelion in adventurer gear, saving worlds which are hazardous to Time Lord life? 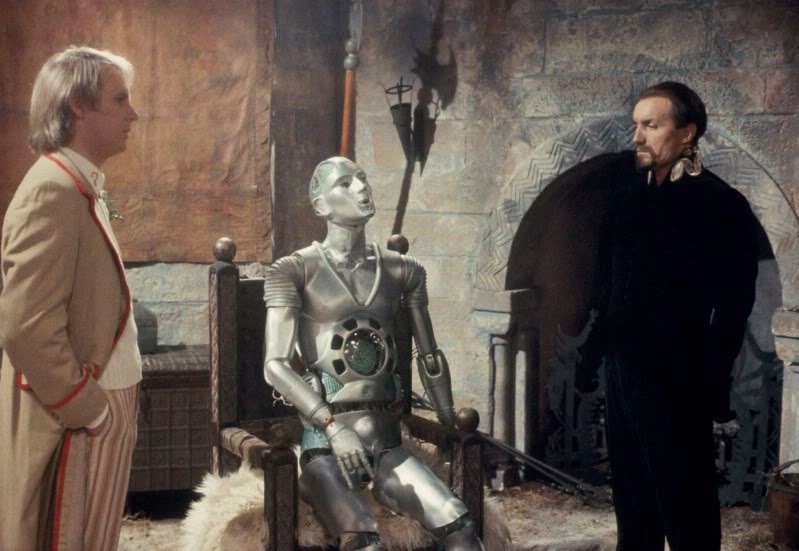 Kamelion on Tara (or indeed in Sherwood), out-androiding the androids…Where are the adventures that could redeem the shiny shape-shifter and make us genuinely sorry, when we re-watch Planet of Fire, to see him die?